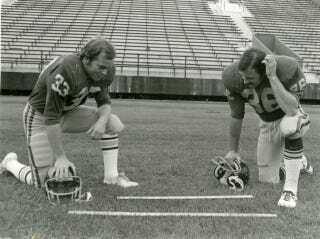 On September 17, 1977, Carleton College and St. Olaf College played the Liter Bowl, the first NCAA-sanctioned game to use metric measurements, and probably the dorkiest piece of football ever put together. Top to bottom, the whole story is unapologetically nerdy. It was dreamt up by a Carleton chemistry professor named Jerry Mohrig. The field was 100 meters long and 50 meters wide (109.36 and 54.68 yards, respectively). There were metric meter lines, metric down-chains, even metric end zones. The ball was 29 centimeters long (within NCAA regulation), but who really knows how big a regular football is. And for its trouble putting the game together, Carleton got smashed. St. Olaf won 43-0, out-gaining Carleton 393 meters to 106 behind an "outside running game" that was probably just one team of nerds being a little more athletic than the other team of nerds and turning that into 302 meters (330 yards) rushing. This was back when there was at least some chance we'd officially move to the metric system as a country. We won't, of course. (My personal theory is that we're too married to round numbers based on standard, like a 100mph fastball or a 6-foot-tall man.) So the Liter Bowl is just a piece of sports dork ephemera, but a fun one at least.